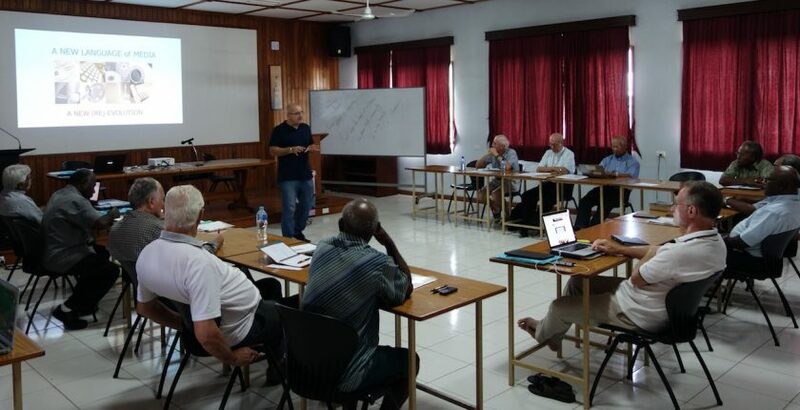 A workshop of the Catholic Bishops’ Conference of Papua New Guinea and Salomon Islands have been organized at Emmaus Conference Center in the capital Port Moresby, and was dedicated to the topic of communication, with a special emphasis on the important area of social communication. The workshop organized by CREC international was led by Fr Fabrizio Colombo, MCCJ, director of SIGNIS Services Rome the 26th-27th September. One of the valuable aspects of this training was a very enlightening discussion on storytelling which is a very important aspect for the peoples of PNG-SI. Telling a good story is the fastest way of getting and holding people’s attention and communicating a meaningful message. And Jesus was indeed the best story-tellers of all time! The bishops learned the various elements for putting together a powerful story… and then they were given the task of preparing a two-minute inspirational message in front of a camera using storytelling. Then came the moment of truth. The video of each of the interviews was presented to the entire group of bishops for comment and constructive criticism. Another very interesting aspect of the workshop was an in-depth consideration of the ever-expanding world of social media. Fr Fabrizio introduced some of the many platforms of social networking: Facebook, Twitter, Google+, WhatsApp, etc. The number of users in PNG-SI is astounding. After an honest consideration of the benefits and also the possible dangers of social media the bishops had the opportunity to interact with the true protagonists of social media: 15 brightest young boys and girls of the final year students of Don Bosco Technological Institute, Boroko joined the bishops for this session. The “natives” of the land of social media, were delighted to lead the “immigrants” (in this case the bishops) to their digital world! The students were paired with the bishops and acted as tutors to them. They shared their experience and expertise in the area of social media and opened up immense possibilities for social networking. Finally, some bishops broke their fears and create with an opening spirit their account on Facebook. After the bishops it was the time for Diocesan communication personnel to have their Media Workshop at Emmaus Conference Centre from September 29th to October 2nd. Animators Fr Fabrizio Colombo, MCCJ, Fr Ambrose Pereira, SDB and Sr Daisy Lisania invited the media personnel from different corners of Papua New Guinea and the Solomon Islands to create and exercise into video making, radio interview, storytelling and social media. The passion and the great interest in communicating the good news was clearly proved in the different sessions of the workshop and media seminar. As Fr. Fabrizio introduced the session the participants were sent by their bishop to be active protagonists of communication in the Church. They discovered the importance to communicate and touch people lives and heart leaving the aside a theoretical and too “preachy” style of communication and giving space to a warm and emotional way to tell the stories of hope and joy that truly and deeply changes people’s lives.